safety-wire, thread adhesives etc. but this offers limited performance. high dynamic loads and thermal cycling. The HEICO-LOCK® system consists of a pre-assembled pair of washers with inclined cams on the inside and radial teeth on the outside. Tightening of the nut/bolt creates a ‘gripping’ action of the teeth thus seating the mating surfaces. 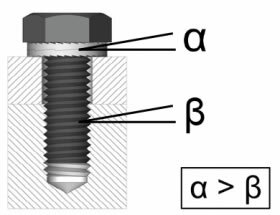 The angle of the cams (α) between the HEICO-LOCK® washers is greater than the thread pitch (β) of the bolt. 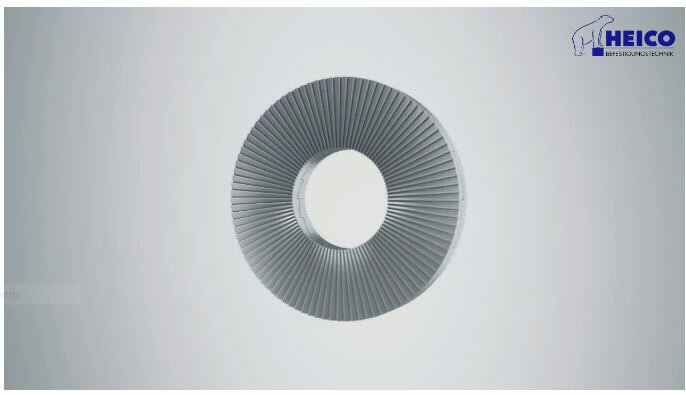 This angle means the expansion in thickness of the HEICO-LOCK® washers is greater than the possible longitudinal movement of the bolt along the thread. With HEICO-LOCK® any bolt loosening results in the internal cams separating and their movement across each other results in an increase in tension and clamp load. During removal, only the cam surfaces move, resulting in low off torque force. The cams on the separation plane (joint face) of the individual washers of the pair show a much lower friction coefficient (µi) than the friction coefficient on the radial ridges on the outside of the pair of washers (µo). The HEICO-LOCK® system is the answer to your bolt loosening problems, contact us now to discuss your requirements or view our entire range of locking products for further information.